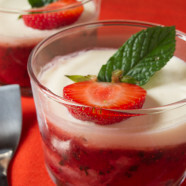 Crème Mascarpone with a fresh Strawberry Salad, a Strawberry Sauce flavored with fresh Peppermint leaves on a bitter almond bisquit – served in different layers in a glass – you got the tast of summer on your palate! 500 gr fresh strawberries Wash strawberries, remove stems and cut length wise into 4 pieces. 2 tbs honey of acacia In a bowl mix strawberries with honey. Allow to rest for 1 hr Prior to preparation allow to soak and refrigerate for at least one hour. 185 gr powdered sugar Mix egg white and powdered sugar with an egg whisk (just mix, not to whisk stiff!). 100 gr ground almonds Stir in ground almonds. 1 tsp liquid almond flavor Melt butter. Add almond flavor and melted butter to the mix. Caution: add melted butter lukewarm – NOT hot! Mix all with an egg whisk slightly. 20 gr of butter to grease cover baking sheet (29 x 38cm) Cover baking sheet (29 x 38cm) with greased parchment paper and evenly spread mass. Time to prepare / 10 min Bake at 180°C for 15 min to a golden brown color. Then take cake out of oven and allow to cool down. Using a biscuit cutter cut out circles of 6cm. Set aside. 1 tbs honey of acacia Wash strawberries, remove stems and mix with honey and peppermint leaves in a blender. 400gr Mascarpone Beat egg yolk and sugar to a creamy mass, mix in mascarpone and set aside. 12 leaves of fresh peppermint Finally decorate each portion with one half of strawberry and one leaf of peppermint on top. Refrigerate for 3 hrs Prior to serving cover glasses with wrapping film and refrigerate for at least 3 hrs.